So here we are. The final game of the 2010/11 season. It's fair to say it's been a mixed season for all. For Arsenal, for us the supporters and for the pundits. At the start of the season I thought we would improve on last season, having seen the troublesome Adebayor moved on with Kolo Toure to Manchester City and the only major signing being Thomas Vermaelen, a direct replacement for Toure. We have improved on last season. This campaign has been no means a disaster. But from their being little expectation on us - remembering the advertising campaign at the start of the season orchestrated by Sky Sports which showed the top four teams as Chelsea, Manchester United, Liverpool and Manchester City - and then coming up alongside United and Chelsea despite defeats to them both only for us to fall away at the business end of the season has left a thought of what might have been with many supporters. What might have happened had we not been defeated by Spurs and kept our momentum going in the league? Had we not capitulated against Wigan in the final ten minutes? Shown more resolve to grind out a result in the FA Cup against Stoke? This season leaves a slight disappointment with many. But overall I feel it has been an improvement on last term. 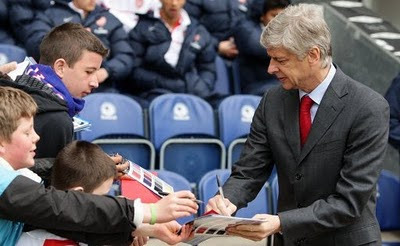 Who would have believed Arsene when he said the young players he had would make the step up this season? Diaby has had a good campaign, as has Song and Denilson. Fabregas has again shown what a world-class player he is with the amount of goals and assists he has to his name. The formation has helped us with our attacking style of play. It enabled us to score all those 79 goals. But it has been at the back where our season has failed. A goalkeeper and a back four who have been responsible for individual errors, which have cost us dear. But it is as a team we have failed to protect our goal. All too often our left hand side has proved to be our weak link. Too often has Clichy or his replacement been exposed. Whether it was Diaby or Nasri playing in front, all too many of the goals we conceded appeared to come down that channel. I hope that is an area where we can improve next season. The only other area, which has hampered our season, were the injuries which kept so many key players out of action for so many weeks of the season. We have been unlucky. But at the start of the season we knew we shouldn't rely to heavily on Tomas Rosicky or Eduardo. And that has been proven with their mixed performances. Others have failed to show their promise. I would have hoped to see more from Theo Walcott and Carlos Vela. Andrey Arshavin has also had a poor showing on his excellent first six months following his arrival in the UK. I know he has often been played out of position but I think he could have shown more of his class when he was in his favoured forward line role. So to sum up. A good season, with the taste left in the mouth of what might have been.